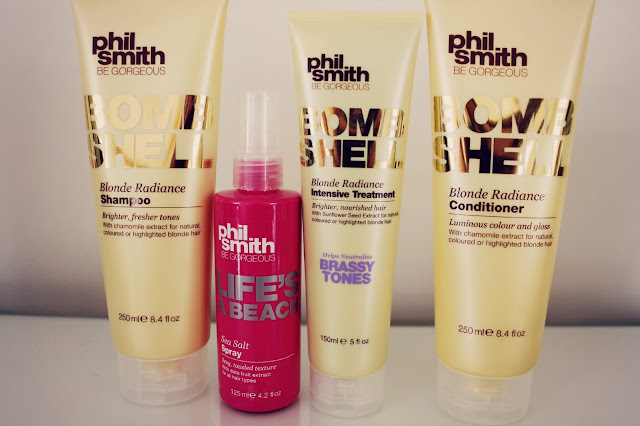 My hair is something I have really been trying to take more care of, sometimes I don't realise it but I do put quite a lot of heat on it and think I need to look after it more so I was excited to try out these hair products by Phil Smith. If you aren't aware of Phil Smith, he is an award winning celebrity hairdresser so he definitely knows his stuff! 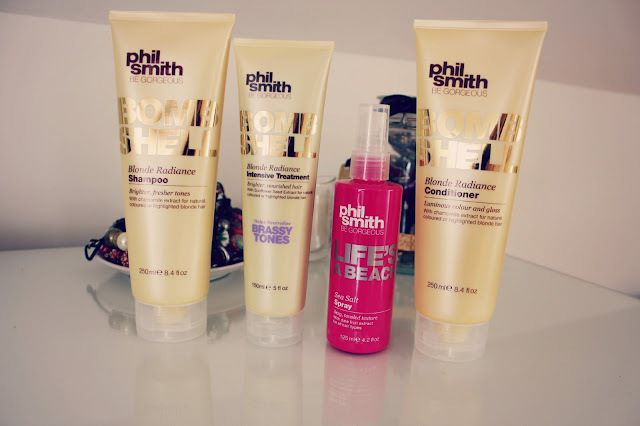 The shampoo and conditioner claim to "brighten and refresh blonde shades," my hair is definitely prone to looking a bit dull sometimes and I have tried a number of different products to make my hair look more radiant. I have really enjoyed using the shampoo and conditioner, they smell really lovely and I have genuinely felt like my hair is looking a lot brighter! The conditioner is a little different than others I have tried, the consistency is thinner and runnier than ones I've tried before, which took a little bit of getting used to! I used the Intensive Treatment once a week, I got a bit of a shock when I went to use this as it's bright purple! It looks the same colour as the purple hair dye I used to dip dye my hair! This works if you have any brassy tones in your hair as it neutralises them so this would be great would great if you dye your hair blonde and it looks a bit brassy! After using this my hair felt really nourished and soft so I will definitely continue to use this every week to keep my hair in good condition! Finally I've been testing out the Life's a Beach Sea Salt Spray, you will probably know that I love my sea salt sprays! I have quite flat hair that doesn't really do too much, it doesn't have much volume or texture so I rely on Sea Salt Sprays to give it some! I have been spraying this onto towel dried hair to add some texture, I can barely feel it in my hair and it doesn't give it that "crunchy" feel that I've had when using salt sprays before! Overall I'm really impressed with these products especially as they are so affordable, the shampoos retail for £3.99 which is a great price for the quality! Have you tried anything from the Phil Smith Be Gorgeous range? I've heard a lot about this brand but never really tried it myself, might have to!